ATLANTA (Jan. 9, 2018) — The Southeast United Dairy Industry Association (SUDIA) has new leadership, new branding and a new name — The Dairy Alliance. This change represents the new vision and mission of the organization. 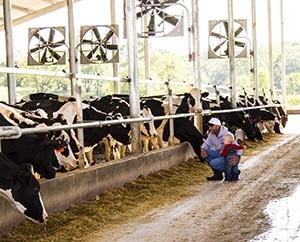 The Dairy Alliance has an emphasis on market-focused partnerships that proactively promote and protect the interests of 2,100 dairy farm families in the Southeast. The new branding initiative includes a new logo, a strategic mission and vision and a renewed effort to expand partnerships and provide growth opportunities in the dairy industry. Since 1971, The Dairy Alliance has been the voice for dairy in the Southeast. The primary goal has been promoting milk and dairy foods for farmers and working with industry partners. The organization started with just four states and has grown to nine, including Alabama, Georgia, Kentucky, Louisiana, Mississippi, North Carolina, South Carolina, Tennessee and Virginia. The reorganization aims to represent its partners, to grow and to meet the challenges facing the dairy industry with knowledge and innovation. The Dairy Alliance uses scientifically-based research and information to champion the dairy industry to organizations around the country including farm bureaus, departments of education, school nutrition associations, state nutrition directors, health professional organizations and others. On behalf of dairy farm families, the non-profit the Dairy Alliance, works with schools, health professionals, retailers, dairy processors and the public to promote dairy foods.